The charming west coast town of Pafos focusses around an attractive little harbour whose picturesque open air fish restaurants line a quayside of bright fishing boats and pleasure craft. With a population of just 28.000 Pafos nestles In the lee of the Western Troodos Mountains, which add another dimension to this area of scenic beauty. The recent addition of its own international airport nearby has opened up the Pafos area, and the resort is graced with some luxury hotels along the coastline. Pafos has an air of holiday charm combined with history, and olden-day elegance is lent to the town by its classical style buildings in the upper part of town which leads to the shopping area. The lower part of the town - known as Kato Pafos has a life of its own albeit so close by, down near the sea -home of the harbour, the fish tavernas, souvenir shops and several beautiful hotels with important archaeological sites around them. Pafos is entwined with Greek mythology, and the legendary birth of Afrodite on her shores brought fame and worshippers there to follow the cult of the Goddess. 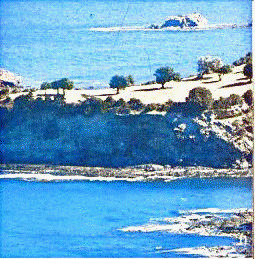 Landmarks associated with Afrodite are the chunky, rugged rocks of her beautiful birthshore known as the Afrodite Rocks or "Petra tou Romiou", the evocative sanctuary of Afrodite at Kouklia Village, one-time shrine and scene of pagan festivals for thousands, the Baths of Afrodite at Polis, supposed source of fertility and the Fountain of Love, or Fontana Amorosa, a few miles further into the Akamas Peninsula. Even the town's name is linked to the Goddess, for Pafos was the name of the mythological daughter of Venus and Pygmalion. 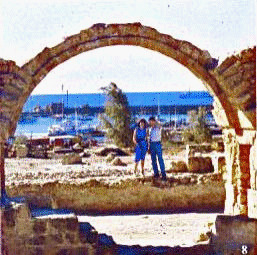 Pafos became the capital of Cyprus under the successors of Alexander the Great - the Ptolemies and in those days its harbour was a busy, thriving port. It continued as the island's first city for more than seven centuries, retaining its importance under Roman rule Its most famous Governor Sergius Paulus, was converted to Christianity by St Paul in 45 AD. 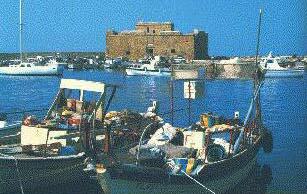 But Pafos history dates back a great deal further. In fact the whole area abounds in historical and archaeological treasures. Attractive collection of Cypriot antiquities from the Papho area, dating from the Neolithic Age to 1700 AD. Kato Paphos, St. Paul street. 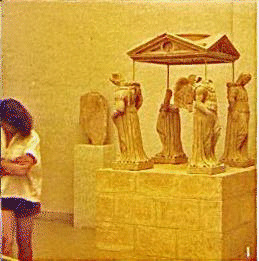 House of Dionysos, House of Theseus and the recently excavated House of Aion. The amazing mosaic floors, of these 3rd century AD noblemen's villas, are considered among the finest in the Eastern Mediterranean. They mostly depict scenes from Greek mythology and are beautifully executed. A small 2nd century Odeon entirely built of well-hewn limestone blocks. 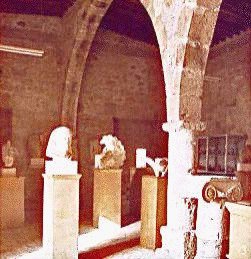 It was uncovered by the Cyprus Department of Antiqulties in 1973-4 and is now regularly used for musical and theatrical performances. Kato Paphos, near the harbour. This castle was built in the first years of the rule of the Lusignans (beginning of 12th century) maybe on the site of a previous Byzantine Castle. It was destroyed in the earthquake of 1222. Originally built as a Byzantine fort to protect the harbour, it was rebuilt by the Lusignans in the 13th century, then dismantled by the Venetians in 1570, who found themselves unable to defend it against the Ottomans, who in their turn restored and strengthened it after they captured the island. Dating from the Early Christian period, probably early 5th century and dedicated to 'Our Lady of the Harbour'. Almost completely destroyed during the 7th century Arab raids. Built in the 1 3th century, over the ruins of the largest early Byzantine basilica on the island. Within the compound, one can see the so called St. Paul's Pillar, where according to tradition Saint Paul was flogged at some time before the Roman Governor Sergius Paulus was converted to Christianity. Excavations are still going on. Kato Paphos, facing the harbour. Theoskepasti means 'Veiled by God' and according to tradition, God sent down a fog to protect the original church during the Arab raids. The modern church was built in 1923. 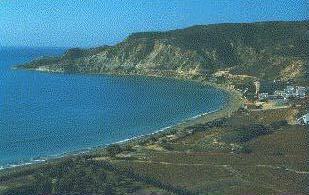 The name of the village comes from the Greek word "Hieroskepos", the sacred Garden of Aphrodite. Fascinating collection of Cyprus folk arts and crafts gathered together in the house known as Hadjismith. Yeroskipou village, 3 km east of Paphos. 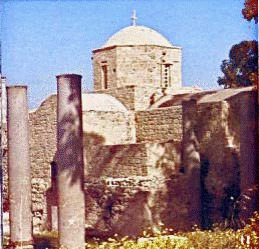 One of the most interesting and attractive Byzantine Churches on the island, dating to the 10th century, with a vaulted basilica, a nave and two aisles surmounted by five domes, with later frescoes dating to the 15th century. 3. TEMPLE OF APHRODITE Kouklia village, 14 km east of Paphos. 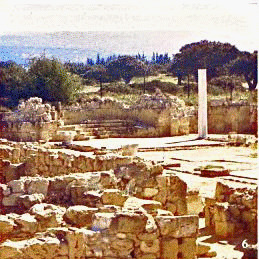 This is Palaepaphos, Old Paphos, one of the most celebrated places of pilgrimage of the ancient Greek world, and once an ancient city kingdom of Cyprus. Here are the ruins of the famous Temple of Aphrodite, the most ancient remains, go back to the 12th century B.C. The temple was one of the most important places of cult and pilgrimage of the ancient world, till the 3rd-4th century A.D. The Museum, housed in the Lusignan Manor, is small but impressive with many finds from the area. 25 km east of Paphos. According to legend, Aphrodite, goddess of love and beauty, rose from the waves in this strikingly beautiful spot. The Greek name, Petra tou Romiou (The Rock of the Greek), is associated with the legendary frontier-guard of Byzantine times, Dighenis Akritas, who kept the marauding Saracens at bay with amazing strength. It is said in one such fight he heaved a large rock (Petra), at his enemy. 3 km north of Paphos, Emba village. A 12th century church standing in the centre of the village. A series of icons and two panels with the 12 Apostles date to the middle of the 16th century. Ayios Georghios Basilica and the picturesque fountains. Peyia village, 19 km north-west of Paphos. In Peyia, do not forget to quench your thirst at the picturesque fountains which can be found in the beautiful stone-paved village square. 41/2 km from the village, near the fishing refuge, are the ruins of two early Christian basilicas with some very interesting mosaic floors depicting animals. This site must have been an important establishment in Early Christian times. There are also rock-hewn tombs of the Roman period above the sea. 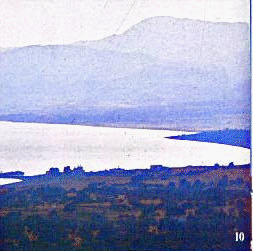 9 km north of Paphos. Founded around 1200 by the Cypriot hermit and writer Neophytos. 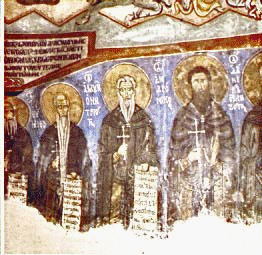 The Encleistra or Enclosure carved out of the mountain by the hermit contains some of the finest Byzantine frescoes dating from the 12th to 15th century. In the Monastery's church there is an interesting collection of icons and remains of 16th century frescoes. 40 km north-east of Paphos, turn right before Stroumbi village. The monastery is also reached from Kykko (forest road). 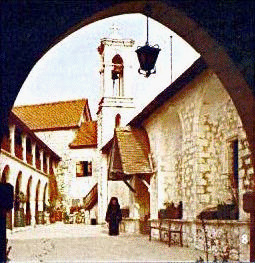 Set in beautiful surroundings, this monastery, dedicated to Our Lady of the Golden Pomegranate, was originally founded in the 12th century but the present building dates to 1770. 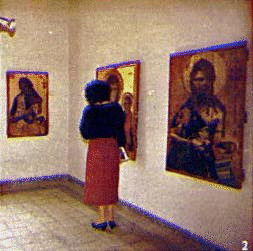 The monastery has a collection of important icons and treasures. An impressive religious ceremony and celebrations are held on 15th August. Recently the old winery of the monastery was reopened and produces some of the best vintage wine available in Cyprus. On the west of Troodos 1 1/2 km from Chrysoroyiatissa Monastery. The birthplace of President Makarios. The house, where he was born, has been turned in a museum. An area of breath taking beauty associated with Aphrodite. According to legend, the goddess Aphrodite used to bathe in the pool of the nearby natural grotto, which is shaded by a fig tree. A trail from the Baths takes you to Fontana Amorosa (8 km from the Baths, at the end of the Akamas Peninsula). Walking along this trail, one can enjoy an incomparable view and unspoilt nature (especially in Sing).